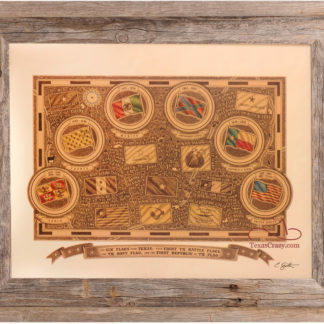 We’ve done all the work for you in selecting just the right custom frame and coordinated mat to go with your Texas themed open and limited edition Texas framed art prints. 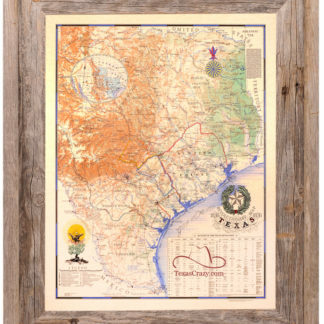 We’ve also hand picked framed artworks from the many Texas symbols that Texans share: longhorns, lone stars, wildflowers, the Alamo, San Jacinto, the Republic of Texas, missions, oil and gas, Texas map shape, regions of Texas, and city landmarks, all celebrating the uniqueness and diversity of Texas life throughout the lone star state. These images celebrate historical Texas ranch life and landscapes near impossible to describe with paint or a photograph. These specially designed home and office framed art pieces can serve as unique Texas corporate gifts for that special client and recognition awards for those top office associates. You also “might could” hang them proudly in your own den as Texas home decor for your home or office. To browse our Texas Framed Art, click on any picture below.